24x24x16 HighCell 16D Turbine V-Cell Dual Phase ASHRAE 95% Gas Turbine Filter Plastic Frame w/Single Header Gasket Both Sides | Air Filters, Inc.
Air Filters, Incorporated™ HighCell 16D™ ASHRAE 95% Dual Phase Turbine 4 V-Cell with Gasket Both Sides add 30% of additional filter area, reduces pressure drop and increases/extends filter life. Perfectly designed for use in air filtration handler systems using filter banks and/or side access housings. These filters are specifically designed to withstand surging and pulsations due to centrifuge compressors, gas turbine and industrial engines. 4 V-Cell provides a superior combination of low pressure drop and high efficiency through the use of our unique MINI-PLEAT design. This extended surface design ensures low resistance to airflow and reduce energy cost. 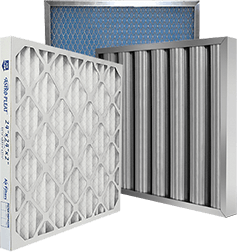 Air Filters, Incorporated™ HighCell 16D™ ASHRAE 95% Dual Phase Turbine 4 V-Cell Filters are durable, Plastic frame makes the 4 V-Cell of choice in filtration systems with high velocities, variable air volumes , high moisture. The lightweight Plastic frame installs easily into side-access housings or front-load holding frames and is an ideal choice to replace bag filters and other box-style rigid filters. 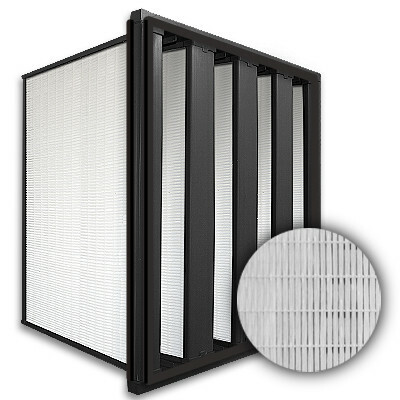 Single header frame with Gasket Both Sides is constructed from Plastic and secured to frame with specialized media sealant ensuring the elimination of air bypass.